Audio problem: When Sgt. Henshaw is telling the platoon to get rid of the horse, he is speaking but it's clear his mouth isn't moving. Continuity mistake: When Bilko's men are doing the obstacle course, the number of people on the cargo net varies from close shot to wide shot. Sgt. Bilko: Luis Clemente. This guy is smart, very smart. He has an IQ. Sgt. Bilko: It's the odometer Wally, it says 12,000 miles and it should say 11,000 miles. Tony here drove it to Lake Tahoe over the weekend to go to his grandmother's funeral. Walter Holbrook: Oh, I'm sorry, Tony. Sgt. 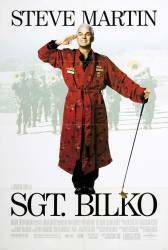 Bilko: When I say "go to his grandmother's funeral", I mean visit his niece. And when I say "niece", I mean lady friend. Look. I'm winking. Look at my eye.